The Himalaya is paradise for the bikers in India, which offers the most picturesque and extreme landscapes. Riding through the rough terrain around the snow capped mountains is nothing but adventurous. 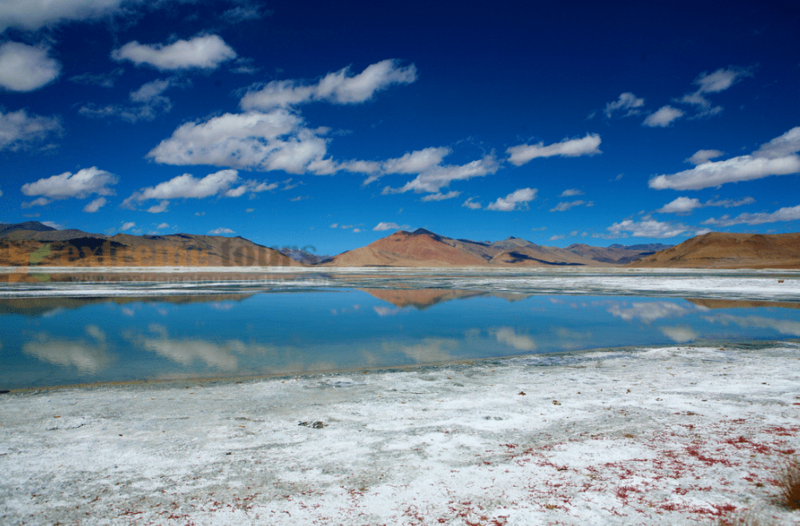 One the most popular trip among the bikers is around the Ladakh in 12 days. The journey literally touches the two international borders, China on the East and Pakistan on the North. Below is a list of what this complete tour package include and excludes. If you have any further question you can ask us freely. Complete trip generally takes 12 days. 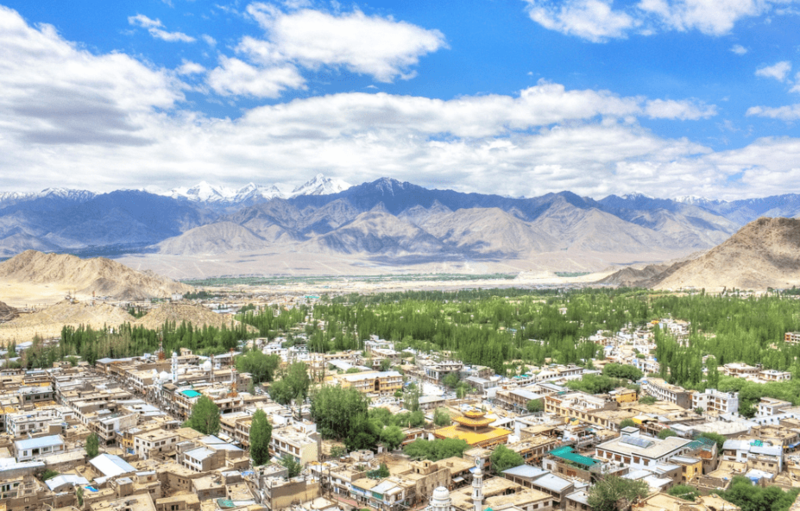 Leh – Ladakh is commonly known for its cold, remote, rugged and fascinating nature, located in the Himalayan Desert. Bikers usually get their chances of cruising around the area to enjoy the serene environment with elegant landmarks. The journey will take you to the three highest salt water lakes averaging around 13,000 ft, worlds highest mountain passes averaging around 16,000ft. and to the regions which are still lives in old times. Moderate-Tough – Riding level is thrilling and varied from paved to dirt to gravel. It isn’t a route for the inexperienced biker, but an experienced rider will also find it enough of a challenge without being over faced. Temperatures could rapidly changes from hot to quite cold, with rain, and even some snow possible. The weather is as unpredictable as the uncharted terrain, only adding to your adventure. You will meet us outside the International Airport Terminal 3 of New Delhi on a given time. From here we will fly to Leh in Ladakh valley situated at the height of 3500 mtrs deep into Himalaya’s. You will be transferred to your hotel rooms, where you will be advised to take rest and acclimatize to the high altitude. You may feel slightly dizziness due to lack of oxygen or AMS (acute mountain sickness), but it going to be be alright by tomorrow morning. If you feel okay, go on for short walk and local sightseeing. After Breakfast you will be introduced to your Motorcycle. These are mean machines same as of India’s traffic and roads. Take it for short ride after brief intro and briefing on motorbikes, rules and regulation and India’s driving condition’s. Get used to the Motorcycle and it’s controls. Also your permits will be obtained today. So be ready for tomorrow’s ride. After morning Breakfast, we will ride to Khardung La (La means pass) located at the height of 18360 ft. It is claimed to be highest motorable road on Earth. It will be test of your riding skill and a steep step forward to mountain drive experience. 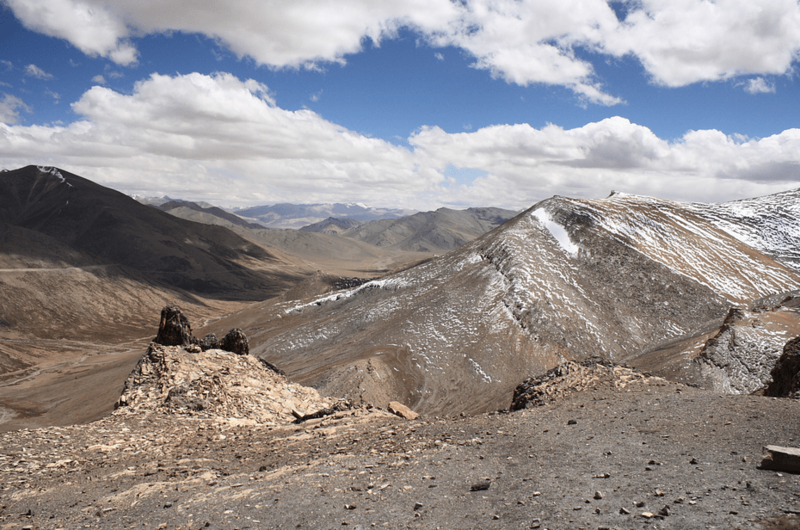 After a brief stop at Khardung La top we ride further towards Hunder situated in Nubra Valley. Hunder is 30 km from the Khalsar which is the junction of two roads one leads to panamik and second to Diskit. Diskit is comparatively small then Leh but it is a major town of the Nubra valley which have modern facilities. Go for local sightseeing and a camel ride in sand dunes. Accommodation in very good camps. After Breakfast we ride to Pangong Tso (Tso means Lake). It is a high altitude brackish lake changes color according to daytime. The lake also lies on border of India and China makes it an high security area. We’ll cross the river Nubra and ride through some sand patches. You’ll encounter the ancient Himalayas and its Raw Beauty. The Road to Pangong lake is quite dusty and Unpaved, but the sheer glaze and the beauty of lake worth it. Trek along the lake and explore the area. Accommodation in comfortable tented camps. We ride back to Leh through Chang La his time. Another crazy pass with uncertain weather and traffic. Road to it’s ascend and descend is in poor condition. Ride can be quite tough though. We shall reach leh by evening. After dinner, have a good night sleep. Today we’ll take a day off from the tour and enjoy the enchanting beauty of the city and its surrounding. Go for souvenir shopping and explore the near by bazaar. Today will be our longest single day ride. We’ll head for Upshi early morning. From here we’ll take left turn from the Highway and snaked along the River Indus through a canyon till Mahe bridge checkpoint. It’s all dusty and loose Gravel from here till Tso Moriri. The Lake is Wetland conservation serves the ground for breeding for the rare black necked Crane. The Lake lies in Korzok village which also have a very old monastery. You will have lot of time tomorrow morning to explore the Lakeside. The accommodation in comfortable tented camps or hotel rooms depend on the availability. 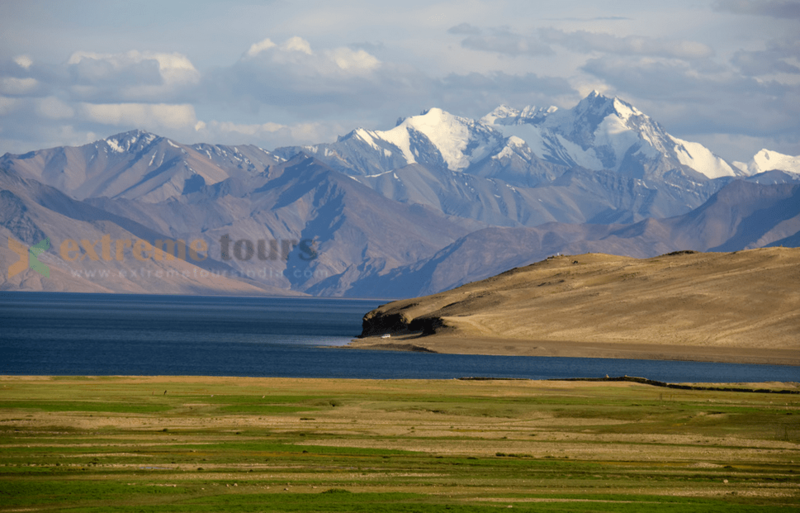 The journey to Tso Kar is a beautiful blend of absolute mountain landscape, occasional sightings of the Changpas nomadic people of Tibet and their herds of yaks & goats. we’ll turn left crossing another high pass Polokongka La 16000 ft. over few sandy stretch of mostly gravel roads to reach the beautiful brackish lake called Tso Kar, the third high altitude lake on this tour. Surrounded by a wild life sanctuary, Tso Kar is a salt lake and breeding ground of many rare migratory birds. Accommodation in comfortable tented camps inclusive of all meals. We’ll ride back to Leh city throgh a new route also the most famous among the bikers. Ride to Moore plains which is 35 kms straight stretch on Manali – Leh highway NH21. Drive to Tanglang La 17500ft., a high mountain pass to enter into Ladakh valley and ride to Leh city alongside River Indus. The second last day of motorbike journey takes you down a trip to Alchi. The world heritage Alchi monastery provides proof of human will and endurance over time. The beautiful scenery on the way and the magnificent monastery provide a final touch to an amazing adventure. Riding 150 kms in a day and night stay at Nimmu House makes it the fitting finale to an amazing journey, through mountain passes, desolated wilderness, tough weather conditions, an ode to the triumph of human will against all adversaries and odds. A short ride to Leh after breakfast and the motorcycle journey ends here. Remaining day is for shopping, pictures and feedback. Our journey ends at the airport. You’ll fly back to Delhi by a early morning flight. Check tour availability for fixed departure. You can book the fixed departure tour from us or you can contact us for customized tour plans.